Twins Sandy and Annie were popular in their lifetime. Their joke timing was perfect from the time they were toddlers. Their routines regularly got them extra cookies from parents and grandparents. And by the time they were in high school, they would get asked to introduce presenters and concerts to warm up the audience. No one was surprised when the twins got into show business but they were a little shocked when their show business became a little... cult-like. This comedy based cult was a hit. Their cult went well until the twins were doing their trademark hilarious backward trot and holler routine in a beautiful desert scape where they were pontificating to their hundreds of followers. They fell off a cliff, cartoon style and that was the end. But their followers just couldn't let them go. They've used their bones as a leader ever since. We like to think Sandy and Annie are still telling jokes! This hanging skeleton has two heads and long, creepy hands. 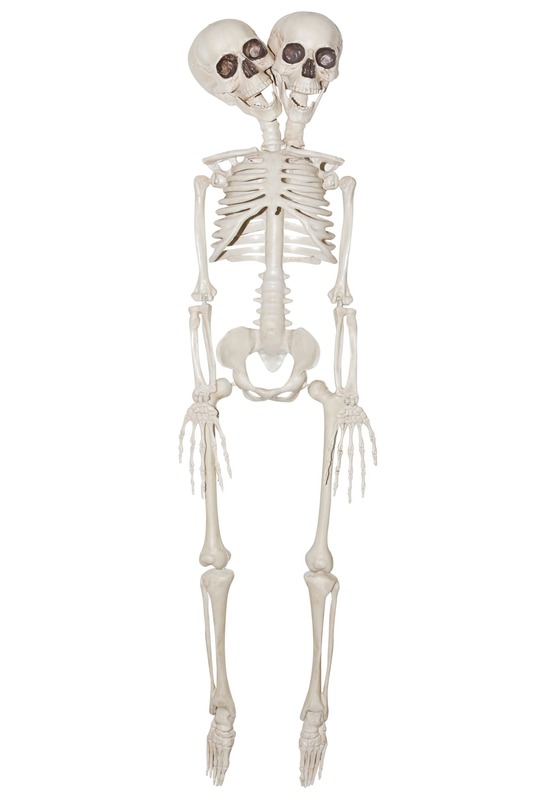 The skeleton has moveable joints along the ankles, hips, wrists, and elbows so you can make it pose however you choose. At about twenty inches tall, you can hang this skeleton up to make your Halloween decor double in awe!